74 • FOODSERVICE EQUIPMENT & SUPPLIES • OCTOBER 2018 facility design p r o j e c t o f t h e m o n t h Food Production Food production takes place in 750 square feet. Just as at The Refuge Bar & Bistro, the design team maximized every inch of space. "The space is incredibly small for the amount of volume pro- duced here," says Egnor. "The menu had to be limited, and we had to have a certain amount of space to meet health department regulations for warewashing, refrigerated storage, sinks and exhaust hoods. We had to be sure we had no cross-traffic for clean and dirty dishes. With- out a doubt, this restaurant operates at maximum efficiency and produces the highest revenue per square foot as I've ever designed." Food arrives up to 6 times a day from 7 a.m. until 1 p.m. at the restaurant's back door. 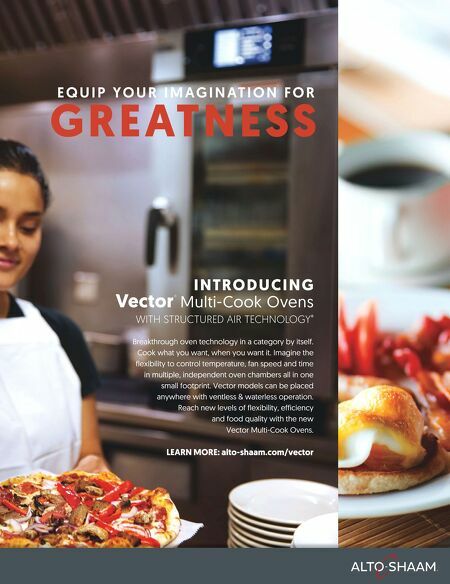 "The space is so small that we must receive many orders daily," says Vincent Alexander, executive chef. "As soon as the food arrives, we immediately remove food deliveries blocking the doorway." Staff place food in a walk-in cooler or attached walk-in freezer. "One of my culinary instructors always said, 'Work does not go into the freezer; only finished work goes into the freezer.' We follow that guidance and use the freezer for specific instances like storing items such as hamburger patties for large events." Food remains in the cooler for a short time — usually less than 24 hours — before staff prepare it for the evening meal or catered events. Staff take the ingredients either to cold or hot prep areas. Ceramic, glazed tiles surround the preparation and cooking areas. "The tiles provide cleanable surfaces and don't melt in the hot temperatures surrounding the wood-fired chargrill," Egnor says. "I've restructured the kitchen operation so the lead cook focuses on the ingredients coming in and out of the walk-in ● Owners: Mark Zientek and Matt and James Kowalski, all partners of Kowaltek LLC, Spring, Texas ● Managing Partner: Mark Zientek ● General Manager: Luis Padilla ● Executive Chef: Vincent Alexander ● Architect: NM21 Design Studio, Houston; Nathan Moore, owner ● Interior Designers: NM21 Design Studio, Houston, and Mark Zientek ● Foodservice Designer and Planner: JME Hospitality, The Woodlands, Texas: John Egnor, principal ● Equipment Dealer: WebstaurantStore, Lancaster, Penn. 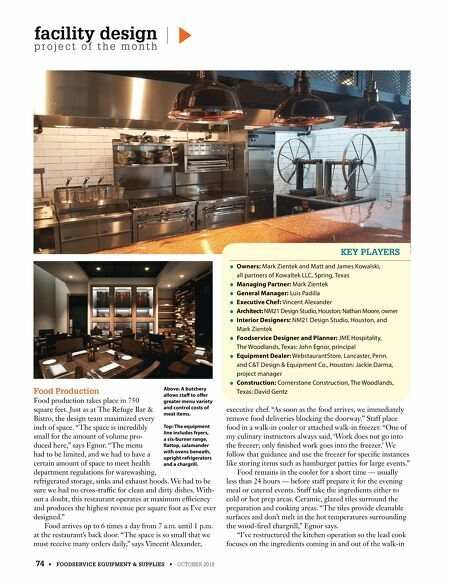 and C&T Design & Equipment Co., Houston: Jackie Darma, project manager ● Construction: Cornerstone Construction, The Woodlands, Texas: David Gentz KEY PLAYERS Above: A butchery allows staff to offer greater menu variety and control costs of meat items. Top: The equipment line includes fryers, a six-burner range, flattop, salamander with ovens beneath, upright refrigerators and a chargrill.